A cemetery in the nation's capital is hosting twilight tours before Halloween. 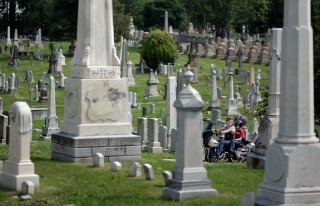 Congressional Cemetery will host the first of its four "Soul Strolls'' on Friday. The cemetery's 67,000 residents include 16 former senators, 68 former members of the House and two vice presidents, according to the National Park Service. The cemetery says the hour-long tours will leave every 20 minutes from 6 p.m. to 9 p.m. and beer, wine and hot cider will be for sale. Tickets are $20 for adults, and children under 12 are $10. The other dates for the event are Saturday and Oct. 23 and 24. The cemetery is usually only open from dawn to dusk.